Zhuo Qi is from China (Fuxin), and often goes to Jingdezhen, a city that has produced pottery for over 1,700 years, an industry that also generates mountains of waste from which he often draws his raw materials. After studying at the École des Beaux-Arts in Le Mans and the Haute École d’Art et de Design in Geneva, he deepened his studies into ceramics at the École Nationale Supérieure d’Art in Limoges and carried out experiments in porcelain factory kilns. Zhuo Qi stokes his œuvre with the linguistic and semantic misunderstandings he witnesses, and of which he is sometimes the victim, a state of tension between Chinese and Western culture: “I have no other choice than to work with these very common misunderstandings. They are an opportunity to extend language, to play with meanings and signs. I invent nothing, I transform and grasp for myself only what is already existing in the collective imagination.” The relationship with language and non-meaning are thus the constitutive elements of Zhuo Qi’s approach. The artist navigates from one language to another, gives form to misunderstandings. 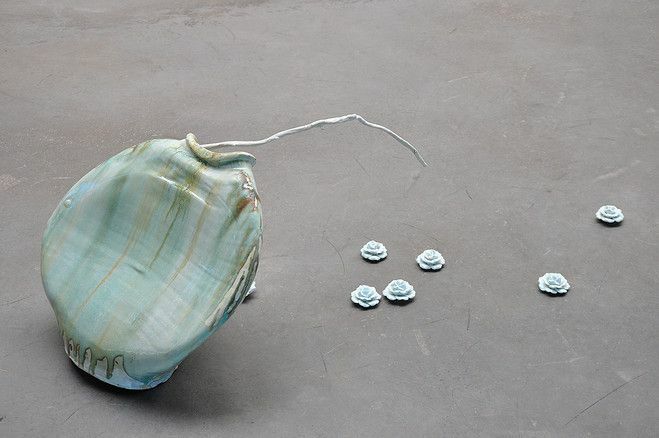 He combines Chinese and French expertise to develop his own specific technique: a radical and performative use of porcelain. It is both the material and the subject. He transforms and manhandles the ceramist’s traditional forms to produce disconcerting sculptures, radically at odds with the usual function of the objects that he manufactures, collects or restores. The artist’s iconoclastic spirit makes fun of “delicate porcelain” by incorporating it in improbable objects (teddy bears, bricks, etc.). With the J’ai allumé un vase group, he attacks it with fire crackers, mixing two emblematic practices of Chinese culture: the traditional technique of ceramics and the popular use of fire crackers celebrating the Chinese calendar. In 2018, during an arts residency at the Contemporary Ceramics Centre of La Borne, Zhuo Qi focused on the vase, an object par excellence of the potter’s craft. Produced in collaboration with the ceramist craftsman Georges Sybesma, Zhuo Qi took a lived experience as a starting point: a vase can “survive” falling down when it contains flowers. He then proposed a series of tipped-over and distorted vases, from which spring forth against earth (and always in ceramic) flowers, branches, stalks and petals. Here again, the artist emptied the conventional bouquet of flowers standing on a table of meaning, thereby turning the art of living upside down. In Zhuo Qi we should see the posture of an iconoclastic artist of languages and symbols who nourishes his work with several artistic legacies. Y’a des jours comme ça confronts us with the vision of imperfect ceramics, the image of a contemporary “bungle” fully taken on board.